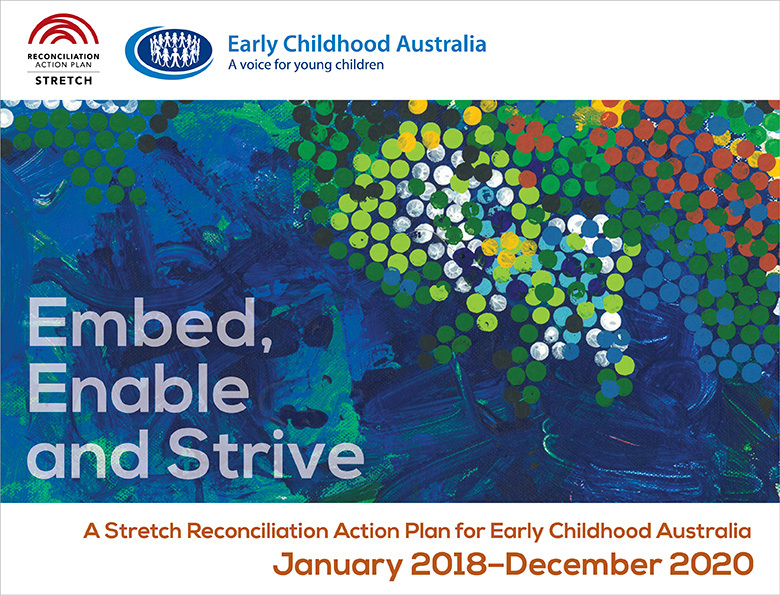 Developed with extensive consultation and support from the community, the Early Childhood Australia (ECA) Stretch Reconciliation Action Plan: Embed, Enable and Strive functions as a platform of values and principles from which ECA as an organisation can help advance reconciliation in our communities, and provide leadership and support to the early childhood education and care professionals it represents. The Reconciliation Advisory Group was appointed by the ECA Board of Directors to continue and support the philosophy and implementation of ECA’s Stretch Reconciliation Action Plan (RAP). We encourage everyone to read the RAP and think about how you can work towards reconciliation in your service. Reconciliation: it’s everyone’s business. ECA has compiled a variety of resources and information related to reconciliation including cultural awareness, relationships with families and improving children’s outcomes. To view these resources click here. If you are interested in viewing our ECA’s 2018–2020 Reconciliation Action plan, click here. As part of our ongoing commitment to acknowledging reconciliation in the early years, ECA will be hosting the ECA Reconciliation Symposium at Moonee Valley Racing Club, Melbourne, 10–11 May 2019 to explore reconciliation within the sector. Click here to learn more. Early Childhood Australia acknowledges the traditional owners of Country throughout Australia and their continuing connection to land and community. We pay our respects to them and their cultures, and to the Elders both past and present. Incorporating welcoming and acknowledgement protocols into official meetings and events recognises Aboriginal and Torres Strait Islander peoples as the First Australians and custodians of their land. It promotes an awareness of the past and ongoing connection to places of Aboriginal and Torres Strait Islander Australians. Click here to view ECA’s protocol on Acknowledgement of Country. As part of ECA’s commitment to acknowledging reconciliation in the early years, ECA hosts an annual national Reconciliation Symposium. The first symposium was held in Adelaide in 2015 followed by Sydney in 2016, the Gold Coast in 2017 and Fremantle in 2018. The 2019 Reconciliation Symposium will be held in Melbourne, 10–11 May. Registrations are now open, click here for more information. The Reconciliation Symposium explores the nature of reconciliation within the sector and brings the matter of reconciliation in early childhood into the spotlight to work towards a better future for all Australians. A comprehensive list of resources and online information for Early Childhood Educators about supporting Aboriginal and Torres Strait Islander educators, cultural awareness, events and celebrations, relationships with families, creating culturally welcoming spaces and more is available on the ECA Learning Hub here. We have a Facebook group – ECA Reconciliation Champions. This is a forum for Symposium delegates to share ideas and how your service is going about practical reconciliation. Relevant resources on reconciliation will also be regularly posted on the page to assist early childhood professionals improve their practice. We encourage you to post links to resources you are using. Click above to request to join.